Outhouses were not too uncommon in Stoney Creek, Tennessee when I was growing up. Not everyone had one, but there were plenty of them still standing and waiting for “emergencies”. I doubt many people in the good ol’ USA today ever experienced the joys of the call of nature without indoor plumbing. We were actually lucky. We at least had running water in the kitchen, and by the time I was about 8 or 9 years old, we even had hot water! But the modern bathroom was a long time coming to our house in the country. Oh, we had a room we called “the bathroom”. When my grandfather built the house we grew up in in 1932, he must have had big plans for indoor plumbing at some time in the future, because of this odd little room that we always referred to as the bathroom. About the only resemblance it had to a real bathroom was it’s size. Small! I have no ideal what this small room was used for at first, but when we were growing up it was kind of a storage closet for everything that didn’t have a rightful place in the rest of the house. It may have been originally used as a “bath” room, or a room where you would take a bath. You see, if you have no bathroom, you have no bathtub, or shower, or commode. So you took your weekly bath in a big metal tub that you carried into the house and filled with water, except we didn’t have one of the big metal bath tubs. 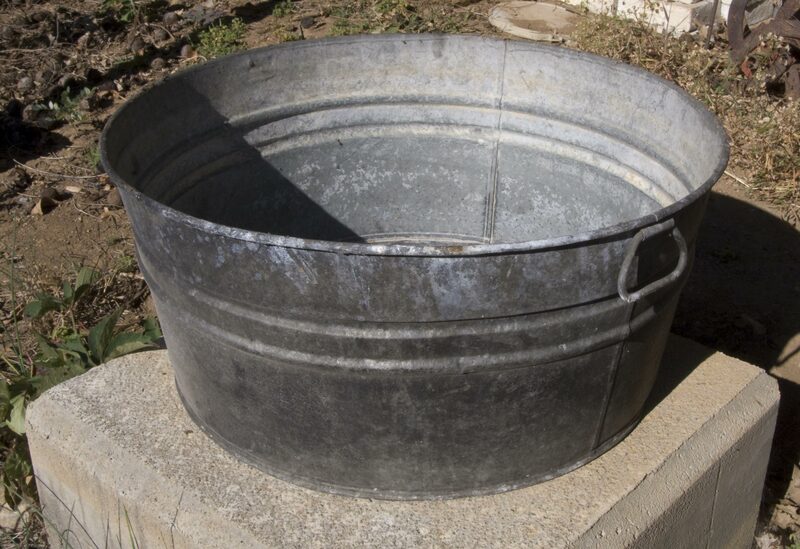 We only had a number 3 round metal tub that was used for bathing, washing the clothes, the dog, or any other activity where large amounts of water were involved. And we all took our baths in that old number 3 …in the bedroom. But not all at once! You waited until Friday or Saturday night and at the highly recommended suggestion of Mom, you went out to get the “wash tub” as it was called. It always hang by a nail on the back porch outside the house. You would carry it into your bedroom and sit it in the floor beside the bed. You would then carry a pail full of hot water from the kitchen sink into the bedroom for the tub, then carry a pail full of cold water to cool the hot water down. You would then close the door to undress and bathe. None of the doors in our house had locks except the front and back door, which didn’t help a lot when you were in your bedroom naked and others in the house were not paying much attention to what you were up to. Things could get interesting at times, and real interesting at others, depending upon whom was taking the bath when someone “accidentally” opened the door to the bedroom during this weekly ritual. Nowdays, you automatically know not to enter a bathroom when the door is closed. But not so when your bathroom door is also your bedroom door which was normally free for anyone to open. There was very little use of the term “privacy” when we were growing up! After you had finished your bathing ritual, you would then dress and seek someone to help you carry the “washtub” and it’s contents outside to pour it out. You would then hang the tub back on the side of the house, or let the next victim take it to their bedroom and try their luck at finding privicy when bathing. Of course this took place in summer or winter, and carrying a washtub full of water thru the snow at night could be just as interesting. But the outhouse! Now there was a real treat. 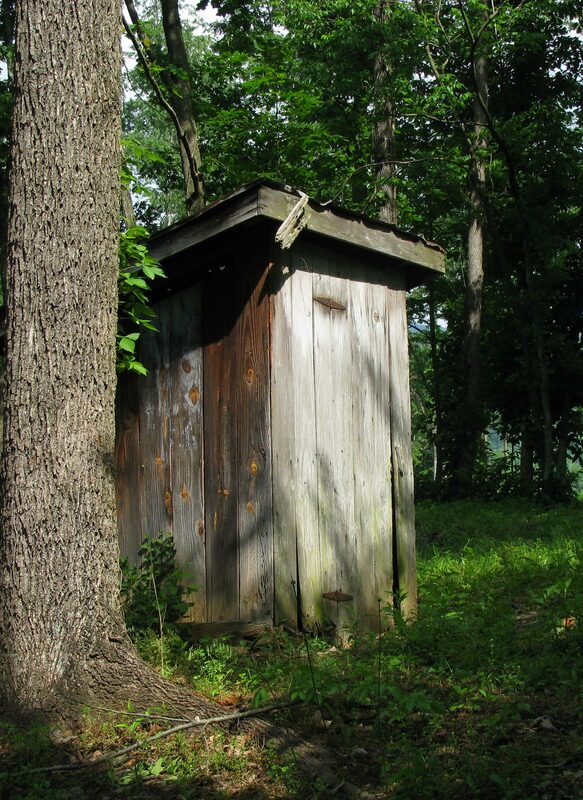 For those that did not grow up with this bit of important plumbing, you must understand that there are certain ways and rituals you must follow when using the outhouse if you want to prevent a lot of embarrassment and/or the possiblilty of a trip or two to the doctor. You see, you just don’t plop yourself down on the seat of one of these things Willy-Nilly! The great outdoors is amass with all kinds of Gods little creatures, and the old outhouse can be home to many of them! First off, you don’t just walk up to the door of an outhouse and go in. As you approach said outhouse, and if you want to keep things from getting exciting real quick, you slow down and “eye” the surroundings so to speak. Bees and especially wasps can build a nest around these things before you know it, and so you watch for and try to identify things that may be flying around the perimeter other than the normal flies. You will eventually learn the flying patterns of many insects while visiting outhouses, something that can sometimes be very handy around the farm. Wasps have this slow flying method and their wings create a low raspy sound when flying. Yellowjackets are smaller, faster, and usually have a direct flying pattern to their nests. Bumblebees usually fly around slowly with a distint buzz, but it’s all a shame. Those suckers are fast when they want to be, and they can cause you to dance a fancy jig, they can! But hornets are the worse of the lot. They’re posessed! Really! They will go out of their way just to hunt you down. It’s like they’re angry at the world for their existance and looking for someone to take it out on. So once you get to the door, you unlatch it and open it, but not so fast as to cause any excitement from anything that might happen to be lingering around in there. Slow and easy as they say, and don’t stand in front of the door opening! Give whatever might be in there a few moments to get out of Dodge. It also pays to take a quick look around inside now instead of just jumping in like everythings going to be hunky dorry. If everything looks safe enough, you then step inside and close the door, latching it from the inside all the while keeping your eyes and ears open to any signs of danger that may be lurking around out of sight. Do. Not. Sit. Down. On. The. Toilet. Seat! You see, some of those nasty little creatures that visit outhouses actually have the nerve to go inside the very hole in the ground that the building sits on! And the only way into that hole in the ground is the hole in the seat! And some of them will actually hide under the seat or it’s boxy housing! And many of them can bite! And some of them can sting! And some of them can cause problems that a little dancing around won’t cure! Your first and most important line of defense is, as I mentioned above, Do Not Sit On The Seat!!! …but to climb up on the housing that holds the seat and… squat! Yeah, I’m afraid you read that right… “squat!” Now this may sound vulgar and very red neckish to those that have never had to experience living with outdoor plumbing, but trust me on this. When in Rome, do as the Romans do… Squat! You see, what this does is provide a much needed space of safety from the boogers that can and will be in said hole. The first time a bee flies out of there and between your legs, you will be thanking your lucky stars that you were squatting instead of having pinned your tail down to the seat! This goes especially so when you see a big spider crawl out near your foot. And when the inevidable garden snake slithers around on the floor from behind the seat housing, you will find you can “spring” much better from this position rather than a passive sitting position. Come to think of it, you might not want to latch the inside door! If everything goes smoothly, you should have no problem during your daily visits to the outhouse. It’s always the exception when you learn the most. In the summer is when you need to pay most attention to your daily visits to the outhouse. In winter, you have less to worry about with insects and crawly things, but you should still keep your guard up! The cold winter may also bring to mind the verse of scripture where Jesus says to Judas, “Go, and what thou doest, do quickly”. As a matter of fact, you learn to not take too much time in summer either concidering all the things that could go wrong while on your visit. And never, ever play pranks on anyone while they’re visiting “the facilities”, even if it is a lot of fun! This entry was posted on October 24, 2010 at 1:58 am and is filed under FUNNIES....	You can follow any responses to this entry through the RSS 2.0 feed. Both comments and pings are currently closed.